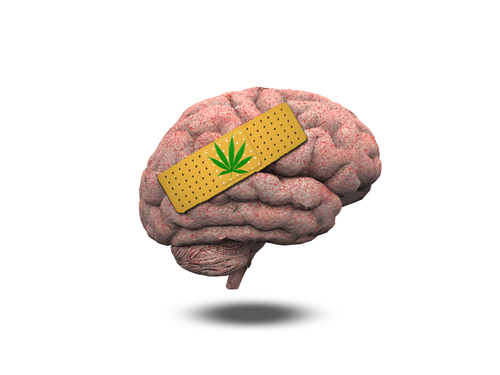 Pure Green Express Blog - How Does Marijuana Affect the Brain? It is well-known that marijuana has medical properties, which can release the symptoms of various diseases. But the regular use of weed may make the person addictive to the plant. It may be clear when the pot smoker will require a higher dosage of hash, what may directly influence his ability to judge as well as can reduce his power to think. A lot of people believe that smoking marijuana has absolutely no risks to human’s health. But according to innumerable researchers, there are some risks associated with consumption of marijuana and the section that is affected the most is teenagers’ one. If teenagers get addictive to marijuana when their brain is still developing their learning ability will be significantly impacted. Chronic marijuana smokers can have adverse effects on their judgment, personality and reasoning skills. How Does Marijuana Effect On the Human’s Brain? Scientists have found that marijuana has both short-term and long-term effects on the human’s brain. When a person smokes marijuana, the main element of this plant, known as THC, quickly passes through your lungs into the bloodstream. Chemicals move to the human’s brain and other organs throughout the whole organism. THC elements impact on specific brain cell receptors. Those cell receptors contain THC-like chemicals that are necessary as well as important for a normal functionality of a brain. THC elements of marijuana overactivate the brain cell receptors and the person feels relaxation, that causes the “high” that marijuana smokers feel. A person becomes less concentrated and more relaxed. This effect lasts from 30 minutes to 1 hour. Marijuana is well-known for its enchasing and mood stimulating properties. However, habitual marijuana users experience a reversal effect (depression and anxiety). Searches have also shown that marijuana has not a negative effect on the working memory. If you stop smoking marijuana, your working memory will go back to normal functionality. A lot of frequent cannabis users confirm that they experience a slowdown in their time perception (being under the effect of marijuana). Marijuana users, who smoke on the regular basis, become less motivated. The addict can put off mostly everything until the very last minute. By the other words, the person becomes lazy and less active. When taken in high doses, marijuana can provoke hallucinations. However, hallucinations are rare. To cause visual hallucinations, weed should have a THC content of more than 20%. When marijuana is taken in any form, cannabinoid receptors (located in the brain cells) automatically respond the active ingredient of marijuana that is known as THC (mentioned above), which, in turn, creates sensations that, gives you relaxation and pleasure. Marijuana’s effect on the human’s brain can leave an adverse effect on perception, memory, cognition and motor coordination (as most receptors are situated in your brain). In fact, studies have discovered that the effect of marijuana on the brain is associated with its long-term use. When we talk about how marijuana affects the brain, the first thing that comes to mind is its effects on human’s emotions, mood, and perception. It is prevalent in cases when people try to self-treat their anxiety or depression using marijuana. Counting the other marijuana effects on the brain, studies say it produces some effects like sedation, giddiness, elation. Some users encounter high levels of anxiety and paranoia. Does Marijuana Really Kill Your Brain Cells? The studies show that long-term use of marijuana may lead to problems with concentration and learning. But there is no evidence that states the fact that marijuana kills brain cells, and there is not enough evidence that proves this fact. On the other hand, there is some evidence that clearly shows that marijuana doesn’t kill the brain cells. In fact, it is said that cannabinoids found in marijuana help to rebuild the brain cells. All we can say is that marijuana brain cells connection is only a misconception until it will be 100% proved. Everyone likes those things, which are able to bring pleasure and excitement. That’s why addiction is a very complex theme. It’s possible to get addicted to everything that brings enjoyment. Numerous researchers have shown that 1 out of 10 who use marijuana become addicted to it. What is about tobacco or cocaine? Their statistic impresses! 32 percent of regular tobacco users become addictive to the drug and above 20 percent suffer from cocaine addiction. So, marihuana is less addictive than the other drugs. But is it significantly depends on the way of its preparation and consumption, what can make a big difference in its health effects, for worse or better. It is always better not to become addictive to marijuana. Of course, it is used for medicinal purposes, but that is prescribed for a specific period of time. In case you have become addictive to the drug and do not find a way to quit, you can seek help from many rehabilitation centers that work toward helping marijuana addict people to quit the drug and recover. They can help you to slowly reduce your dependency on the drug. Certainly, it is not an easy task but with dedication and sincerity, you can make it happen.